At some point, every email marketer worries that their newsletter topic will go over like a five- hour seminar on dialysis equipment. If you don't have your own focus group to mull over every idea, it's simply too easy to pick topics that fall flat. 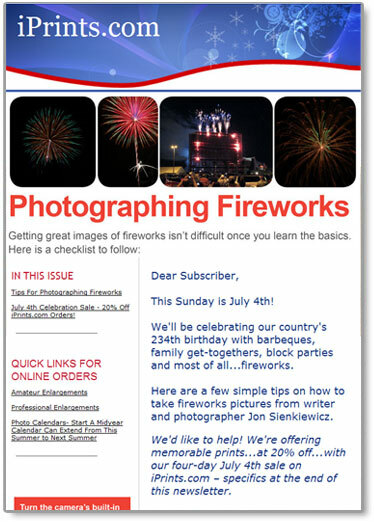 For iPrints.com, our Newsletter Awards winner for Most Interesting Content, finding an intriguing topic was a matter of creatively asking and answering a very common question: How does one (effectively) photograph fireworks? In reality, most people with cameras have at some point tried – and failed – to take great snaps of fireworks, only to end up with dark images framing smudgy, barely there explosions. But iPrints.com not only breaks down what adjustments need to be made, but also when to take the best shots and where to stand to get them. This iPrints.com email does more than pique the interest of readers, it takes a typical-yet-compelling issue and addresses it with crisp, easy to digest text. Thanks to this breezy content, readers learned something new and put iPrints.com's emails on their must-open list. Check out the full-size version of the Most Interesting Content winner's email campaign in the Benchmark Community.